We love bread in this house...especially fresh bread. 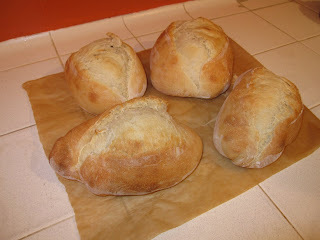 Depending upon what I make for dinner, I bake bread 3-4 nights a week. Focaccia is my go to bread - 1 1/2 hour in the bread maker and then 30 minutes on the counter rising and about 20 minutes in the oven is all it takes. I'll admit that it is a thrill to pull focaccia out of the oven while the olive oil is still sputtering. cut it up and pop a piece in my mouth. As the smell permeates the house the troops file into the kitchen to get their "before dinner" piece. Olive Oil bread is my favorite but it takes a bit more time and as I hate wasting food, need to plan it right so that the day old bread can be used for sandwiches, toast, etc. My neighbors and friends think I am "Martha Stewart" but I'm really not, I just follow directions very well and plan ahead. A good bread maker is my secret because it does all the work for me. Combining, kneading and rising. All I do is fill it up with ingredients and then take out the finished dough. I never use my bread maker to actually bake the bread as not only does the bread come out in a strange shape that is not easy to use but the crust is usually too hard. Not to mention the strange cutout in the center where the dough hook is. I should call my bread maker a dough maker. All this talk about bread has just helped me decide what to make for dinner: focaccia and some of the beauties that you see below. Wow--I can almost smell it! I used to have a bread maker--used it primarily for pizza dough, actually. It busticated and I've never replaced it. I've been thinking about it more lately, wondering if I should get one again...this post is definitely giving me pause! Sandy, my bread maker is an essential part of my kitchen. I keep in on top of my fridge so it takes up no space on my counter in my small kitchen. I found my latest one at Target for $40!